We are delighted to announce you can now choose to have one of our designs in a tartan of your choice, be it your own Clan tartan or just a tartan that you love. Subject to the tartan being available from our Scottish suppliers, we can make a custom Strathearn saddlebag in a tartan of your choice. Each bespoke saddlebag will be subject to a £15 surcharge over and above the ‘standard’ price to account for the extra costs involved in producing a single bag. Please contact us for details of prices for multiple orders. Bespoke bags will take 6-8 weeks as each will be made to order. 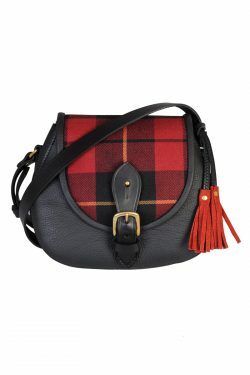 Each bag is made in Scotland using locally sourced materials where possible. It is the sent directly to you from our base in the Scottish Borders. To discuss your bespoke requirements, please email us at Diane.Ness@dunmorescotland.com or call on +44 (0)1968 660 078.